Your 401(k) plan enables you to automatically take advantage of tax-deferred growth. With gradual elimination of most defined-benefit pension plans and great uncertainty around Social Security, saving for retirement on your own is increasingly critical. Although some companies automatically enroll employees in their 401(k) plans, you may need to complete a simple form to participate in your plan. You'll determine how much to save and select your investment options. Don't worry. The amount you save, the way you invest, and even your continued participation in the 401(k) plan are all decisions you can change at any time. You can only participate in a 401(k) plan if your employer allows you to do so. Your employer must both offer a plan and you must be eligible to participate. Therefore, you cannot set up a 401(k) plan on your own. (However, if you work, you can establish an Individual Retirement Account (IRA) privately. If you're self-employed, you'll have other retirement planning options as well.) The key is to avoid missing out on this important opportunity to save for retirement. Missing out on the tax-advantages of 401(k) plans and matching contributions are some of the biggest mistakes people make when starting a new job. For the year 2017, the most you can contribute to a 401(k) is $18,000. If you are 50 or over, you may contribute a total of $24,000. Your employer may further limit the amount you are eligible to contribute. Note that IRA contribution limits are completely separate. Unlike an IRA, there are no deadlines for contributions. However, the sooner you enroll, the sooner you can begin tax-deferred saving for your retirement. Every regular 401(k) contribution immediately reduces your taxable income. For example, an individual in the 25% tax bracket who makes a $100 contribution to her 401(k) plan will immediately save $25 in taxes. (25% x $100). Although her 401(k) balance increases by the full amount of her $100 401(k) contribution, her paycheck only decreases by $75. Unfortunately, a 401(k) contribution does not reduce the amount you must pay in FICA and Medicare taxes. Since the money in your 401(k) plan grows tax-deferred, you do not pay taxes on the earnings in the account. In fact, you do not even report the income to the IRS. It is not until you take your money out of the 401(k) plan, ideally during retirement, that you owe taxes. Investing your 401(k) money is critical to its long-term growth. Your investing strategy should change over time. The younger you are, the more aggressive your asset allocation should be, meaning increased ownership of stocks. As you near or enter retirement, your 401(k) balance should begin to reflect the reality that distributions are not too far away, and you should have a smaller share of your retirement money invested in stocks. Unlike many other tax deductions and credits, eligibility to contribute to a 401(k) plan is not restricted by any maximum level of income. 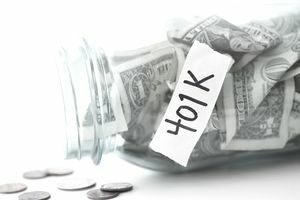 Many employers provide matching contributions to their employees' 401(k) plans. In an employer matching program, the company puts money in the 401(k) plan of each individual who also contributes to their 401(k) plan. If you choose not to participate in your 401(k) plan, you typically forfeit this matching contribution. That's why not participating in a 401(k) plan the level an employer matches is often called turning down free money. Many 401(k) plans offer automatic rate escalation features that allow you to gradually increase contributions. With contribution rate escalation you maintain control the amount and timing of future contribution increases. Some companies even choose to automatically enroll new hires into retirement plans with the ability to opt-out of contribution rate escalation. This "set it and forget it" approach can provide a significant boost to your overall retirement savings. In most cases, you must begin to take money out of your 401(k) plan starting with the year after you reach 70 1/2. The required minimum distribution amount is determined by the Internal Revenue Service and is based on your life expectancy.